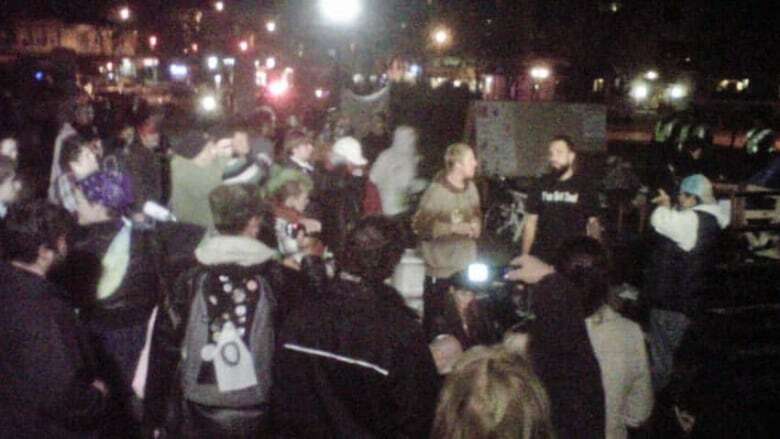 Occupy protesters' tents removed by police in London, Ont. Police in London, Ont., swept into the local Occupy protesters' encampment early Wednesday and removed all tents, marking the first time authorities in Canada have forcibly removed a camp that is part of the countrywide protests. CBC reporter Kerry McKee said a "large number" of London police moved in on Victoria Park at about 12:45 a.m. ET, closing off the entire block near the park. "The tents just started being pulled down … and it was not long before the park was grass again," she said. There were no reports of violence and there were no arrests, McKee said. The park had been quiet in the hours after the police and London city workers moved in, placing protesters' tents in the back of City of London pickup trucks. "There had come a time after 17 days of occupation of our park where it became untenable because we needed to prepare the park for events," London Mayor Joe Fontana told CBC News. Fontana said he was grateful it was all done peacefully and commended both the police and the protesters. The mayor said while he and his council can't change the world's banking system, the protesters could offer "constructive input" in working with him to solve some of the city's own social issues, such as homelessness. By 7 a.m. police had largely moved out of the area, as occupiers were no longer violating a bylaw that prohibits staying in the park between 10 p.m. and 6 a.m. ET. Do you agree with the eviction of the Occupy London protesters? Have your say. As news spread of what happened in London, Toronto's mayor said it was time Occupy protesters in his city left their encampment in a downtown park. "Obviously I'm here to represent the businesses and the taxpayers of the city, and I've been getting numerous calls from people who have told me they've had enough," said Rob Ford, who did not set a deadline. In Vancouver, authorities went back to court Wednesday to try to get an injunction against the protest occupation of the city's art gallery property. On Tuesday, protesters were given a one-day reprieve when the newly retained lawyer for Occupy Vancouver was given another day to prepare his arguments. A B.C. Supreme Court judge is now considering a temporary order that could allow police to arrest anyone who blocks fire officials at the Occupy Vancouver protest. Jason Gratl, the lawyer representing the protesters, is asking for a week-long adjournment to give him more time to prepare his case. Vancouver police Chief Jim Chu also said Occupy Vancouver protesters needed to pack up their encampment or face arrest. Chu told reporters that a clash Monday night between police, firefighters and protesters proves it is no longer a peaceful exercise. He said protesters bent on violence have gone over the line. "Our officers received the full wrath of the protesters. In the scuffle, one officer had his ammunition clip stolen. This can no longer stand." Chu said the once-peaceful protest has been infiltrated by dangerous people, creating a divide within the camp between militant and peaceful protesters. He said police are still hoping for a peaceful end, but are prepared to move in and take down the encampment if the protesters refuse to leave. In Victoria, city officials said they will go to B.C. Supreme Court next Tuesday to seek an injunction allowing the city to remove tents and other belongings at the Occupy camp. Mayor Dean Fortin said the space in Centennial Square is needed to set up a temporary skating rink and to make repairs to the fountain. Occupy Halifax protesters voluntarily left the public square in front of city hall to allow the city to prepare for Remembrance Day ceremonies. They relocated their tents at nearby Victoria Park. "We'll be trying to repair the grass and spraying down the cenotaph," said Halifax Mayor Peter Kelly. He was not happy about the protesters' promise to return to the vacant square this weekend, following the conclusion of the Remembrance Day events. "They have to understand that this is a public square and it's not just for one group but for everybody," he said. "They had their time here." In Calgary, city council voted unanimously Monday night to start moving protesters out of Olympic Plaza. Mayor Naheed Nenshi said the city will start handing out warnings, then proceed to tickets. Nenshi said council would like the protesters to be moved out quickly, but offered no firm timeline for when that could happen. Occupy protests are set to continue Wednesday in at least 10 other Canadian cities. P.O.V. : Is it time for the Occupy protests to move on?